Close your eyes and picture your Thanksgiving meal. What was at the table? If you’re like half of the United States, you saw a casserole dish filled with sweet potatoes and sugar that’s covered with a layer of marshmallows. While turning sweet potatoes into candy is no doubt delicious, there’s another, healthier way to enjoy that naturally sweet food that’s packed with vitamins. After our healthy eating and drinking event at Mariano’s, resident Registered Dietitian Allison Parker created a simple and amazing version of everyone’s aunt’s favorite Thanksgiving dish. Knowing that sweet potatoes aren’t the only temptation at the table, Allison also recommended a few ways to imbibe (if you’re of legal drinking age and choose to do so) without blowing your daily calorie allowance on booze. Try a wine spritzer. Don’t knock it until you try it. When I want to go out with friends, but I have a big day or early morning, I’ll ask a bartender to mix sauvignon blanc, ice and soda water. Get over it. It’s delicious. Mix hard alcohol with calorie-free beverages. Soda water is your best friend. If you drink diet soda, you can choose something like Diet Coke. My favorite combo is tequila (plant-based for the win), soda water and as many lime wedges as I can get the bartender to give me. Call it s skinny margarita if you want or just call it delicious. Stay hydrated. Make sure that you’re drinking water between alcoholic beverages. 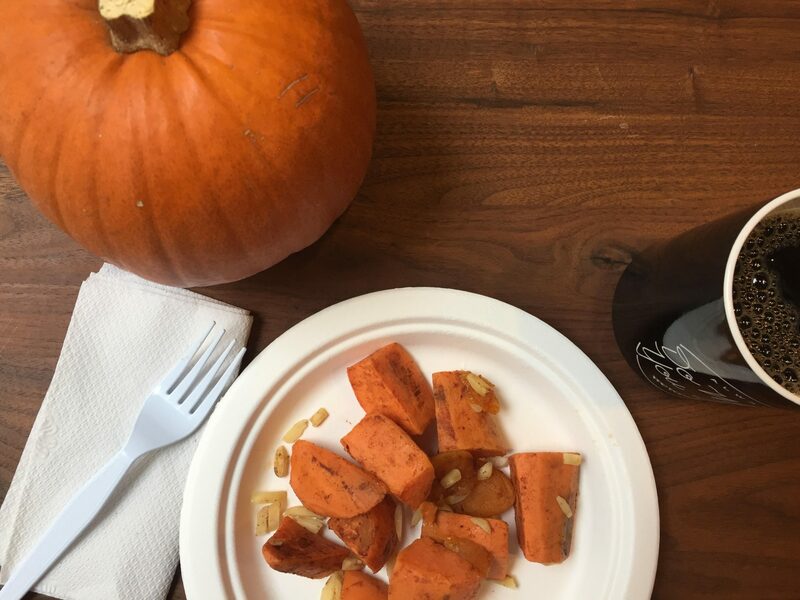 With your healthy beverage choice in hand, get into the kitchen to create this twist on the classic Thanksgiving sweet potato recipe. Your family will love it and no one will miss the marshmallows. This recipe is just as easy as Allison made it sound when she served it at Mariano’s. I made it as a part of my weekly meal prep and it all came together in less than 30 minutes. Bonus: my lunch got me excited for a week of food and family.